She traced her fingers over the newly polished dining table and smiled at the flower arrangement on the centre piece. It looked beautiful. It looked complete -pretty much like how she felt. Sanjana Rao, 38, had completed her fifth interior designing project, successfully. She looked at her wrist watch, still enough time for the clients to get there and have a look; just enough time for a glass of chilled lemonade she had bought in earlier, keeping in mind the hot day. She sat on the beige couch in the living room, and sipped on the lemonade. It refreshed her, it refreshed her memories – she was not always the interior designer she had become today, in fact, things took a turn only three years back. A supporting husband of twelve years and a pair of ten your old twins was all it took Sanjana to move out from a hobby to the business of a professional interior designer. A business based on art, which made her rich – materially and emotionally, it made her confident, it made her smile. Gone were the days when she could not stand up for art, now art stood up for her. She learnt over the years that success does not bring happiness, happiness is success. Art challenged her every day. She had the power to change houses into homes. She decided colors to suit the room, and the colors that in turn gave an aura to the room, she made a dull house more cheerful, she arranged homes; her creativity resonating through every decision she made regarding the same and every action that she did. She was a super woman in disguise, and she owed it all to Art. At Artfairie we celebrate art. We celebrate the colors, the emotions it generates, the connection it creates between strangers – we showcase the works of renowned and upcoming Indian artists, making art accessible to a wider audience. We bring in diverse stories, as diverse as the different colors, but when they all merge in; it creates a marvel, a rainbow. It is art that created history, and it is art that determines a lot of people’s present. It is nothing but important. On a lighter note, it brings us together. It has to be relevant. Have you ever seen art students at a tourist site? There they sit, diligently drawing what everyone else is looking at. So, why are so many people keen on seeing what they draw? There is something about seeing the everyday made into something lasting and beautiful by the magic of art. The wonderful thing about appreciating art, loving or owning paintings is that it makes you see the beauty that is often present in our daily life. The view from the French windows in our house is beautiful. Tall bamboo stems, feathery bamboo leaves, rust tiles and all the other shapes and shades of green. We have palm leaves, ferns, philodendron, canna leaves and they make a lovely, verdant view that I would dearly love to have painted. And if you wipe your mind free of the irritation and the ‘…oh, no, not again’ feeling, traffic jams or crowded streets at night look very dramatic. Think of it, red lights of the cars in front of you and the yellow beams of the cars facing you….look for beauty and you will find it. 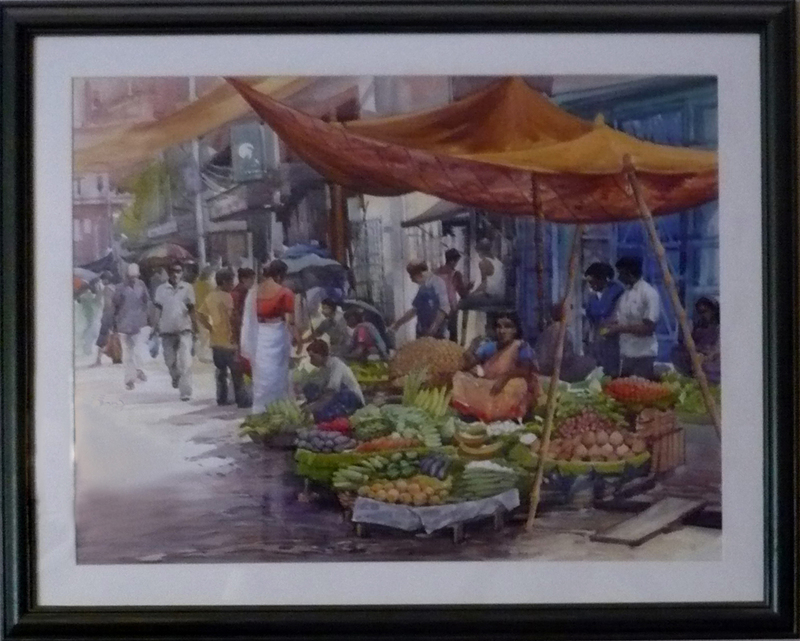 Two of my favourite paintings depict such mundane scenes. 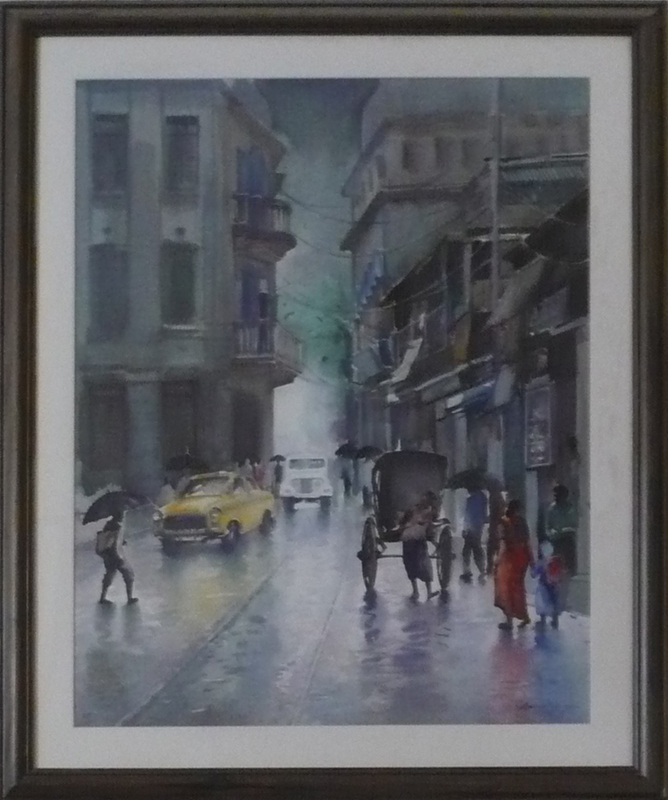 One depicts a vegetable vendor with fresh, bright vegetables and the other painting is of a rainy, narrow Calcutta street complete with rickshaw and yellow taxi. The rain scene is particularly lovely during arid, dry Delhi summers! There is always joy in looking at beautiful things and there is a particular joy in seeing the beauty in ordinary things. 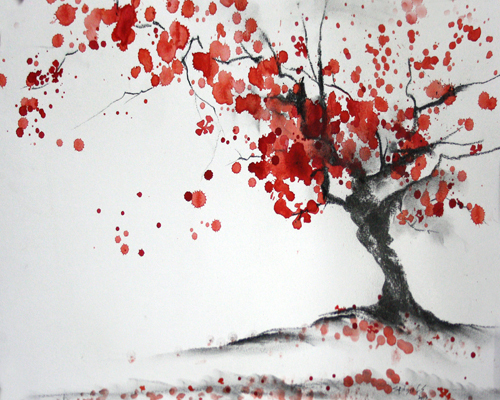 Watercolour painting is both an exacting and suggestive art. By definition, a watercolour is both a medium and the finished artwork. As a medium, it refers to a paint that is water soluble with one of its key attributes being its transparency, allowing brushstrokes or drawings painted under to show through a layer painted over, giving depth and sometimes luminosity to the work. Why do we call it a suggestive art, because in watercolour painting an artist seeks to capture the essence of the composition or scene? 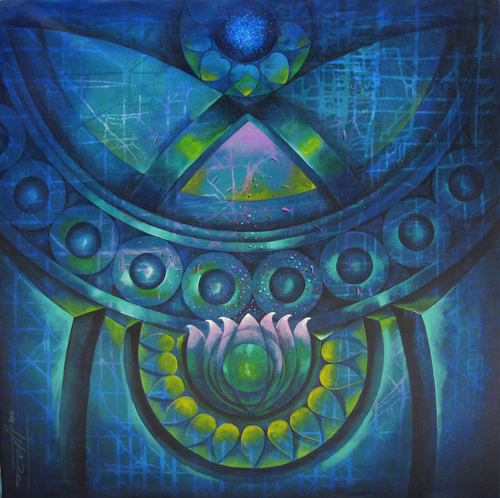 The artist paints a visual image of what they have analysed and internalised. The attempt is to suggest not emphasize or over paint. The image created should hold the correct balance. In watercolours it is said that the tone is the hero and colour just the supporting cast. A true watercolour masterpiece shows an individual personality of its own. View the foreground, mid-ground and background to gauge its depth. Never underestimate the value of a single brush stroke. Examine the whites to see how they get placed against the darker shades. Remember, there is no transparent white watercolour paint; the white parts in a watercolour artwork are often those that are not painted and allowed to be seen as they are carefully placed and left blank while painting the artwork. Imagine how a watercolour artist sees the entire painting before he starts actually sets brush to paper, knowing what colours to merge and where to place his strokes to achieve his vision! Water is an active agent in any watercolour painting, and the artist’s skill in commanding the fluidity of this medium reflects the mastery in his craft. The artist is an alchemist too, blending water and paint to create shades and hues that capture light and luminosity. There is frankly no way of correcting a watercolour painting, any flaws is glaringly obvious. Paint once placed on the paper will leave its mark. It is no wonder then that we admire those who have mastered this craft. What Size Painting to Buy? 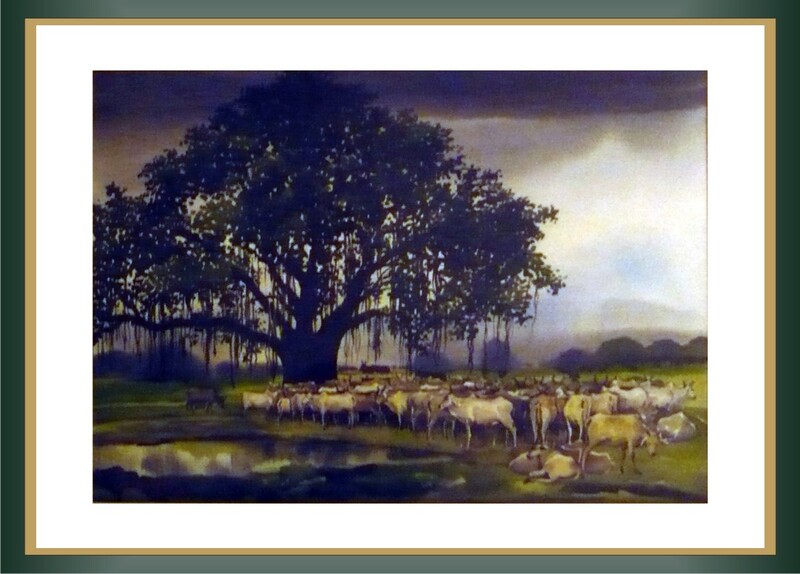 Among various questions which come across someone’s mind while buying art, the size of painting is a very common query. Is less than a full sheet (2*2.5 ft) too small a size to get noticed? Should I look at covering 30% or 40% of the available wall? One Large or Many Small: We all wish to own large pieces of art at the cheapest price imaginable. A few thoughts to keep in mind when deciding on what size of art to buy – bear in mind the area available to hang the picture when making a decision on what size of painting to buy. If you have a large room with a large wall on which to hang the painting a large painting is well worth considering, but if you have a large wall in a small room, it may not be the right decision to buy a large painting as there may not be enough space in the room to get a true appreciation of its artistic value. Budget V/s Size: Unless you have a large house with many rooms and large expanses of walls, its best to start small. Let me expand on the joys of buying small! Now you can define what your measure of small is …and how it fits your pocket :)! The advantage of buying small is that it allows you to indulge this passion (and let me warn you that it truly does become a passion) for a very long time! A wall of many different paintings, of course they must be well arranged and complement each other, adds so much character to a room. You or your visitors can spend hours gazing at the different works, the eyes flitting from painting to painting, learning more and more about each work, discovering hidden nuances that you didn’t notice at first glance. 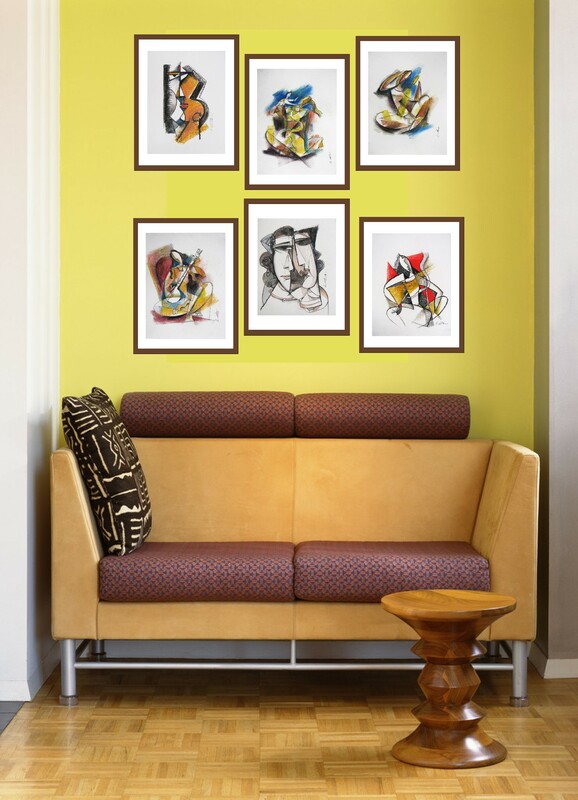 Small paintings have a charm of their own … it’s great discovering them in little nooks and corners of a home! They are also easy on the pocket and make delightful gifts for any occasion. You can never have too many. Arrange them vertically on a narrow wall … or framed and aligned horizontally along a wall or even in ascending order at every other step as a staircase makes its way upstairs …the options are as many and as varied as your imagination …singly or in groups the make a statement. Small definitely can become the new Big! There is a lot of money floating in the market and prices for art are going sky high. Big investors always circle the waters, hoping for a kill. 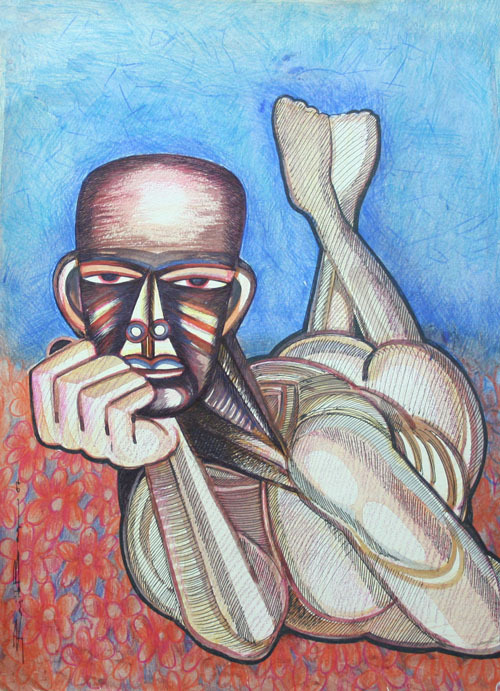 In this situation, with large auction houses like Christies and Sotheby’s also in India, mushrooming Indian art galleries and so many people looking at art for investment purposes, can the small investor think of art as investment? We should keep in mind that the penniless painter of yesterday has in many cases, morphed into a media savvy painter who knows what his paintings are worth. So, forget all hopes of a Vincent Van Gogh like masterpiece in the attic. Money for nothing in Art is a rarity today. One option suggested is to look at new work by budding artists. In fact, curator Sandra Khare, Birla Academy of Art, Worli, looks out for new art during her backpacking travels around India. Before you invest in Art, it is advisable to visit galleries in your city. Look at art sites, read up about artists and look out for news about Art. Decide what kind of art you want to invest in and set your limit. Do not look for instant returns. Keep in mind that what you pay for your paintings should factor in how much you, personally, like it; the artist’s present market value and perhaps, what a more learned art aficionado feels would be his value in the future. Size matters, the larger the painting, the more the cost, If you have a good eye and are prepared to wait for a bit, a painting you buy should seldom sell for less than what you paid. 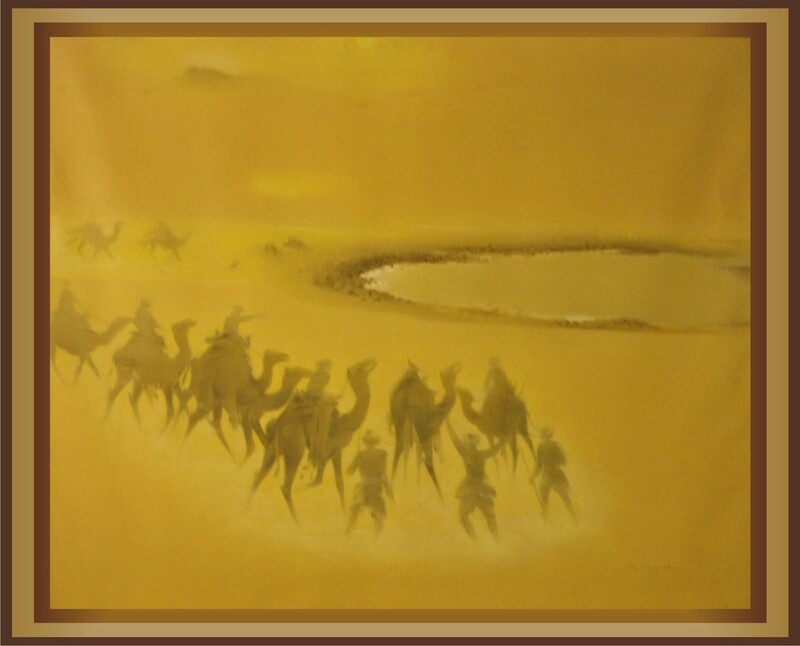 If you do decide to splash out and buy an expensive painting from one of the known names in Indian art, ask for a certificate of Authenticity or Provenance from either the painter or the gallery from where you buy. In today’s environment, where there are a number of fakes floating in the market, you can even get your painting certified by the painter.